The home was completely gutted and renovated in the Fall 2011. The home has two master bedrooms - one up and one down (handicapped accessible), which is wonderful for multiple families staying at the home. Both master bedrooms have flat screen TV's as does the great room so there is plenty of space to spread out. With 3 full-baths and a private outdoor shower, there will never be a wait to rinse off sand from the beach. The home sits on a gently slopped hill to the beach and has 3 sides that face the lake so there are spectacular beach views from virtually every room in the house. We own a home in this same neighborhood that we use regularly with our family. The beaches of Mitiwanga are the best in the area and we fell in love with this family friendly community. We love the area - less than an hour from Cleveland, less than 20 minutes from Cedar Point and the ferrys to the Islands. Centrally located for the attractions of Cleveland, local wineries, Cedar Point and the Islands, this home provides an ideal vacation spot. Beautiful views of the beach and the park from every room. Sit on one of the many decks and watch your family on the beach or playing on the grass of the Park. Tennis and baskball courts are located in the park and are great for the kids. Fish off the piers in the park or take your boat/jet ski to Cranberry Creek (less than 1/4 mile away). Bed linens are provided but not bath or beach towels. Two sets of washer and dryers. Garage and driveway can fit 3-4 cars. Additional Parking on the street in the Park. Extra refrigerator in the garage for overflow. Inside and outside dining areas can seat at least 12. Lots of books for kids and adults. Several patios - each bedroom has a separate patio set and balcony (except kids room). Two main decks with aderondak chairs and table that seats 12. Childrens beach toys and 6 beach chairs provided. Each bedroom on the 2nd floor has a walk-out deck with breathtaking views of the beach and Lake Erie. Mitiwanga Park has tennis courts and basketball courts as well as fire pits on the beach. What more can we say? Our 2016 stay was our most enjoyable yet! Outstanding house and location. The more we get to know the area and the Mitiwanga Beach residents, the more we love the house. Prior raving reviews following our 2014 and 2015 stays still apply. We appreciate the hospitality and support of the very accessible owners. They make sure you'll have an experience you'll want to repeat. You will not regret a decision to relax and vacation here in Mitiwanga Beach. Once again, our family had an amazing time in this home this past July. Our grandkids are already talking about our 2017 vacation! We love the beach and the neighborhood. And the sunsets - oh my, the sunsets are just breath taking!!! This last vacation we spent one day at Cedar Point and a day roaming around Vermillion. It is so nice to have such a short drive to these places. There is nothing like starting and ending the day on the deck. What beautiful sites watching the calm waters in the morning and seeing the beautiful sunsets in the evening. Mitiwanga has always had a special place in our hearts and is our perfect vacation spot. Thank you Mark and Jennifer for your hospitality and for opening your home to our family. See you in July!! We LOVE this house! It has everything and MORE than you need for a fabulous vacation. While there are many things to do and places to go in the area, the best part of this property is spending time at the house. The relaxation and fun begins with early morning coffee on the dock, a walk on the beach, playing in the perfect, sandy bottom lake and wrapping it all up with a sunset dinner on the lakefront porch. The view is spectacular! For our adventurous guests, who still have the energy, it's a short walk down to the Erie Kai Tiki bar. That's always a fun way to end the day. The owners, Mark & Jennifer go out of their way to make you feel at home. They're IMMEDIATELY responsive to any issue that needs attention. They also provide information regarding local restaurants and attractions that gets you up to speed quickly regarding lots of local activity. The house has plenty of room for our friends and family and we try to give them each an opportunity to join us for a day or two. I assure you, once they've spent a day with us at Mitiwanga, they put next summers Mitiwanga dates on their calendar. For all of us, it's been too much fun and created lots great moments and memories! If you're looking for a VERY SPECIAL place to stay for a weekend, a week, or even a month, put this house at the top of your list! 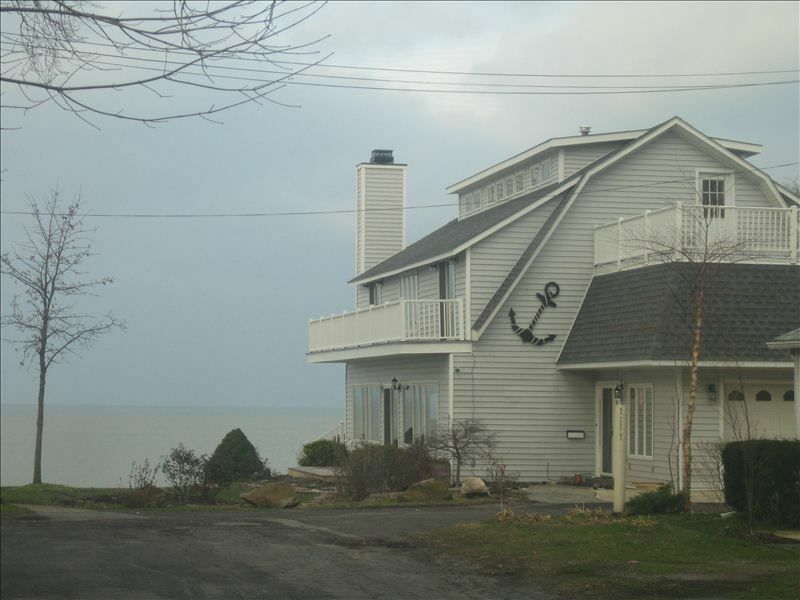 The most beautiful home, with stunning Lake Erie views! My family and I stayed in this wonderful home for the first time this past summer. The owners were wonderful, responsive to emails and even provided a binder to all attractions/restaurants in the area, which was extremely helpful. The home is decorated beautifully, comfortable and enables one to relax with the beautiful setting on top of the hill with views of Lake Erie that we couldn't get enough of! The home comes well-equipped with everything one needs for a relaxing vacation. It has a perfect layout for a large family (we are a family of 6), and we had grandparents with us and still plenty of room. The layout and location was wonderful for our family, our children could be by the water, kayaking, or swimming and we were able to watch them from the large deck! For a mother with 4 kids this was pure heaven for me! We were all able to relax, enjoy every sunrise and sunset from the homes' beautiful decks. Mitiwanga Beaches development has tennis, basketball and volleyball courts which kept my kids busy also, and they could safely walk to. We were only 45 minutes away from home, but we truly felt like we were a world away! The views from the home are spectacular, the sound of the waves outside our windows were calming, and the home was perfect. We already booked our week for next summer and are looking forward to returning the Fish Bowl on Lake Erie! Perfect home and location for anyone needing to get away and enjoy the sound and views of our Great Lake! YES! This house is THE place for a beach vacation in Ohio! If you’re looking for a beach vacation without the hassle, this is it! You won’t be disappointed – look no further! Who knew you could have a wonderful family beach vacation in Ohio! Everything was just perfect--even better than the pictures! Just a three-hour drive, but it felt like being at the ocean: the sound of the waves, the gorgeous sunsets, the calming and charming décor. Plenty of room for six adults and two children in this lovely home. It was fabulous that those who didn’t want to play on the beach could easily watch the rest of us from the relaxing chairs on the deck. Toys and beach toys provided for the kids were an added bonus. Jennifer & Mark were friendly and responsive to emails, just so easy to work with -- they also provided great information about the area. We were especially thrilled with such easy access to the beach, the charming towns nearby and wonderful restaurants (reasonably priced). We enjoyed day trips to the lighthouse, the African safari and a ferry ride to Put-In Bay. This was our first beach vacation in Ohio, but not the last -- as we were driving away, we were already planning our return trip! Perfect Retreat (or any occasion) Setting! We had our church leader's retreat at this beautiful home. It was the perfect place to unwind, relax and be inspired. The home itself is beautifully decorated, warm and spacious. The setting of the home, atop a hill overlooking Lake Erie, is spectacular! The living area is large and open, and connects to the kitchen which is very well equipped. The layout allows for many people to gather and be together. This area also boasts walls of windows, so even when you are inside you feel like you are outside. Our visit was 10/30-11/2, so we had all kinds of weather, sunny & brisk to rainy & windy. All of it was beautiful and very much enjoyed by all. I can't imagine a bad time to stay at this beach home. Every season would be a delight! Definitely one of the premier homes on Lake Erie! Much thanks to Jennifer and Mark for sharing their home with us! Fish right off the peer of Mitiwanga or dock your jet ski or boat at Cranberry Creek Marina which is less than 1/4 mile away.